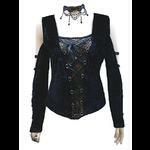 A beautiful black gothic fitted blouse by Restyle made from lightweight cotton with a slight stretch for a good fit. The top has a flattering square neckline trimmed with guipure lace and the lower hems are also trimmed with the same lace. The blouse has a complete row of tiny buttons down the centre front, but the top has been cleverly designed to hide a zip behind these buttons which will save you loads of time! The long sleeves of the blouse have pleating detail at the shoulder seam. A lovely top that will go with so many different skirts or trousers. The roses headband worn by the model in the photo is available separately in our Hair & Hair Accessories section. Bust: 32" Waist: 26" Length: 25"
Bust: 34" Waist: 28" Length: 25"
Bust: 36" Waist: 30" Length: 25"
Bust: 38" Waist: 32" Length: 26"
Bust: 40" Waist: 34" Length: 26"